Sorry I haven't posted for awhile but it is very time consuming trying to get a magazine out and I had surgery in the middle of all that as well. The day the Winter 2017/2018 issue closed, was the deadline for proposals for the Spring 2018. When we were managed by Offingers there were three people who worked on the magazine plus some contractors. Now it is just me and our photographer. Quite a few lessons arrived this fall and despite everything I managed to get them all out within a day or two. It is funny how I notice trends in the lessons. The tip of the week addresses one of those trends. As I reviewed lessons for the Finishing Course and Lesson 3 of the Basics course I noticed something that many students did not seem to understand and it wasn't all that surprising to me. I've taught at conferences all over the country and whenever I teach finishing or gauge, I have to build in extra time to discuss stitch anatomy. Based on my experience the VAST majority of knitters only look at the stitches on their needles, never at the stitches in the knitted piece. If you can't tell the difference between a stitch and the space between a stitch you will find finishing very difficult. 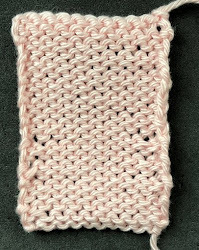 In Lesson 3 of the Basics class, students calculate gauge for different stitch patterns. The best (and most accurate) way to measure gauge is how we do it in the Masters Program. (If you aren't familiar with this method, go to the index of my blog and look under Gauge. There are lots of entries.) I ask that the students place yarn between stitches as the first step in calculating the gauge. To do this you need to know what a column of stitches look like. A stitch in stockinette looks like a "V". In the photograph below, the yellow yarn is IN the center of the stitches in the column. The red yarn is BETWEEN the column of stitches. If I were counting stitches or rows, I would count the "V"s.
In Garter Stitch and reverse stockinette, the stitch looks like a frown. The space between the column of stitches looks like a smile. In the photograph the yellow thread is in the center of the stitches. The red thread is between the stitches. If I were counting the number of stitches, I would count the frowns. Dealing with half stitches in gauge calculations is possible but for finishing it is rarely a good idea. Seams and bands look best if they are placed BETWEEN the selvedge stitch and the next column of stitches. In the swatch on the right, the seam is properly placed and if it weren't for the green yarn tail you probably wouldn't see where the seam is placed. In the swatch on the left, the seam is placed IN the selvedge stitch in the blue piece. Notice that this leaves half of the "V", For the first part of the seam on the white piece, the seam is also placed in the selvedge stitch which does create a "V" but it doesn't really match the other stitches. Selvedge stitches are generally pretty ugly. Half way through, the seam is properly placed on the white side but since there is only a half stitch on the other, it is very noticeable. When seams and bands aren't properly placed, the finished piece looks "homemade" instead of "handmade." When you are finishing you not only need to be able to see columns of stitches but also the stitch itself. When you pick up stitches on a bound off edge, you pick up the stitch IN the stitch below the bound off edge. If you pick up the stitches BETWEEN the stitches, you pinch the stitches together an you get the "dread 11s". When you seam two bound off edges together you seam IN the stitches as well. The photograph below the seam is properly placed in the right swatch. Notice that the column of stitches continues from one side to the other. In the swatch on the left the seam has been placed between the stitches. You can see why the pinched stitches are called "dread 11s". Salon will be on Sunday from 1:30 to 3:20. I finished the Circles Tunic in time for the photoshoot. I didn't knit much until last week. I've been sitting at my computer uploading the Winter issue. I used Elemental Affect Civility Sport for the tunic and the duplicate stitch circles. I had so much of the duplicate stitch yarn left over that I decided to use it for a top for the Spring issue. It took no time at all to knit. The colors aren't accurate. I haven't woven in the ends yet and I haven't cut out the dental elastics yet as I need to write the pattern.